We offer a complete line of audio-visual equipment and computer rentals. MES is a client-focused organization with an extensive history of successful long-term partnerships with our clients. Whether your trade show schedule includes just one show or events on a weekly basis we provide you with a single point of contact to simplify your event rental needs. Our Services include delivery and installation prior to the event. 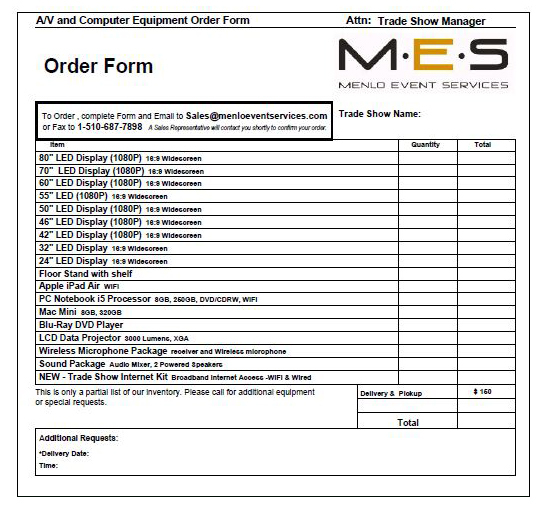 MES will help support throughout the event and removal at the end of the show. We understands the technology needs of Exhibitors and realize the importance of the technology to help promote their businesses at trade shows and conferences. We offer our rental service in all major venues throughout North America. Benefit from our unrivaled experience with the full range of IT logistics, event procedures and protocol and the provision of customizable technology solutions to include procurement, delivery, set up and on-site technical support of all computer and audio-visual products. Our experienced staff will ensure that your event is fully operational and running smoothly throughout the event. The breadth of our service combined with our vast experience, allows our clients to concentrate on their marketing efforts while we guarantee their technology systems will be fully operational. Menlo Event Services takes the worry out of planning and executing your next event, please contact us today!